24’ Crest Pontoons — Rent a party boat in Miami! Enjoy on our Party boat Luxury 22ft' Pontoon is affordable & has the perfect layout that gives you plenty of space for up to 11 passengers to enjoy a day out on the water. Whether on the Intracoastal Waterway, touring the Miami canals, snorkeling, swimming or relaxing on the sandbar you will have an enjoyable day on the water with only your family and friends. We can meet you anywhere from South Miami to Boca Raton. Our Pontoon Boats are Great to celebrate Bachelorette and Bachelorette parties. Perfectly fit for movie shooting and photo shoots. Great to celebrate Birthdays. Our boat is equipped with padded seats a Bimini top for shade, a Bluetooth stereo system, changing room for everyone, an easy board ladder, and plenty of cup holders along with a table to sit & enjoy your meal. The rates do not include gas. Gas will be charged upon the boat return at the marina's daily rate & fueled used. • Miami tour service available. • One large cooler will be provided for free! Just bring Ice! • Great Sound System with Bluetooth and AUX. • Lots of room for storage and to move around, dancing e. t.c. • Toilet available upon request! • Changing room on board. • With great on gas 90 horse power engine! • Discounts for returning customers! Share the cost with friends and enjoy vacation for life! 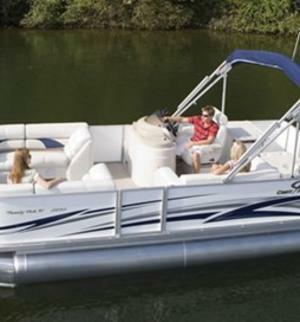 24’ Crest Pontoons - Rent a party boat in Miami!